Iron Chef and I had the occasion to drive about 10 hours in an easterly direction from Podunk in search of some girls hockey action last weekend. Along the way, we made some exciting discoveries. Because round-trip tickets from Podunk to Gillette are such a hot item, I thought I would clue you in on some of the highlights. 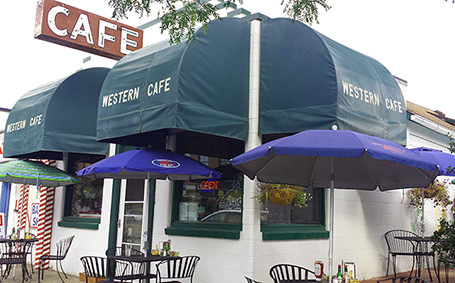 The Western Cafe in Bozeman occupies an unassuming older building on Main Street, complete with slightly sloping floors, and a row of seating at the counter. The place was packed elbow to elbow, cell phones were on the down low, and the official radio station was old school country (think Eddy Arnold and Patsy Cline). Iron had the right idea with his chicken fried steak breakfast. This place is Podunk Approved. Little Bighorn Battlefield, Beyond Billings, Montana. This was an outstanding locale to stop, stretch our legs, and enjoy some good old western global warming. Shirt sleeves in February in Wyoming? The tragedy of this battlefield, infamous as Custer’s Last Stand, is that you get the distinct feeling that the U.S. Cavalry should have simply installed artwork honoring the Native American people like the National Park Service has now done, perhaps avoiding the whole unfortunate affair. 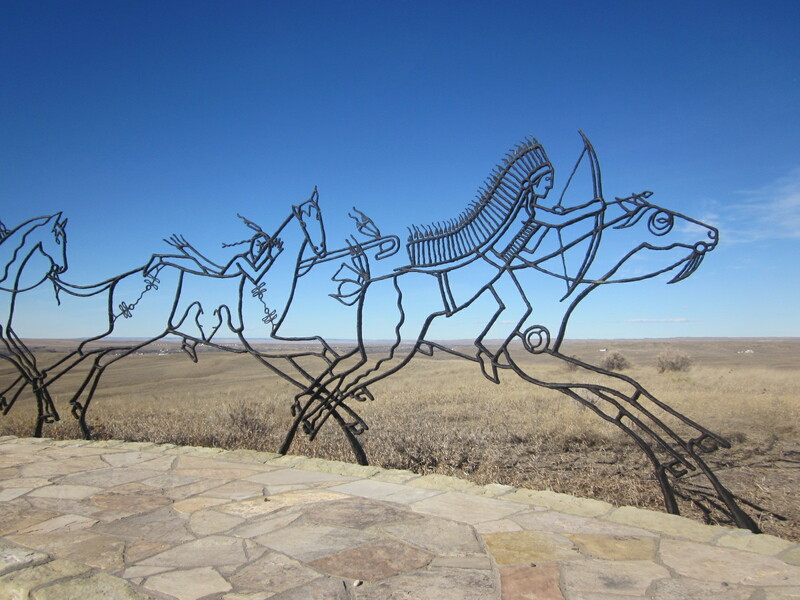 Sculpture at the Little Bighorn Battlefield. Mounds of dirt posing as a town are NOT Podunk approved. 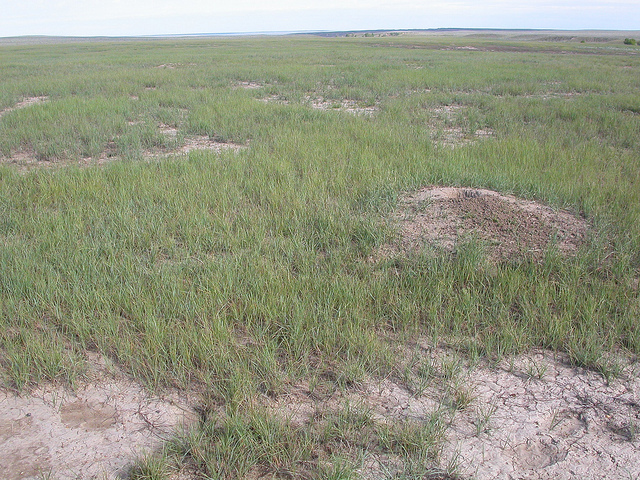 Prairie Dog Town, Montana-Wyomingish. OK this turned out not to be a town at all, despite signs to the contrary. No prairie dog post office, no prairie dog barber shop, no prairie dog gas station, and as far as we could tell, no prairie dogs. Black Tooth Brewing Company, Sheridan, WY. All you need to know is that a brewery in Sheridan had a ginger infused saison they call Le Ging. Yum. Podunk approves. Prairie Fire Brewing Company, Gillette, WY. Prairie Fire is making some stellar beers, but this roomy brewery earned double Podunk approval by having not only 4 flavors of hot wings for your beer pairing pleasure, but also a cameo appearance by random ex-pat Podunk residents. Upon entering, we found Jim and Mary, owners emeritus of Indian Creek Guest Ranch — possibly the County seat of Podunk — quenching their thirst with Prairie Fire. The hell you say! Podunk party approved. Gillette Brewing Company, Gillette, WY. We knew this place would be a winner when we saw the brick oven pizza oven stationed next to an open window at this historic post office turned microbrewery. And we were wrong. The pizza really was quite good, but I knew when Chef asked if I thought his Pilsner tasted more like swamp gas or Chloraseptic that we had a problem. Chef did the unthinkable and sent the undrinkable beverage back, opting instead for the traditionally bullet proof Double IPA. This too tasted like a byproduct of fracking, dragging even a joint offering brick oven green chili chicken pizza firmly into Podunk disapprove territory. Fortunately, Iron and I are Gumby resilient and we landed on our feet a couple of blocks down from Gillette Brewing Co. at the Big Lost Meadery. 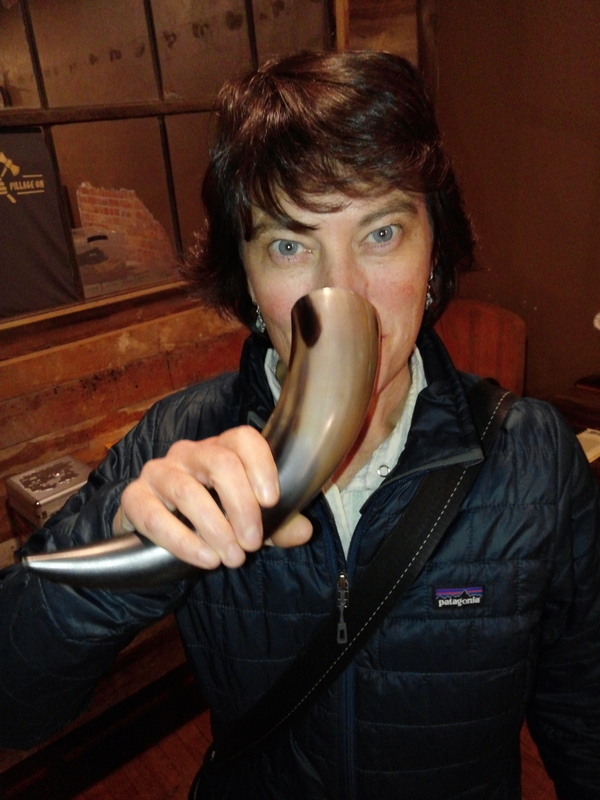 The Big Lost building is beautifully and lovingly restored, but the real attraction here is getting to drink the provocatively named Crazy Woman mead out of a steer horn. Podunk Approved. The final stop of our pillage before returning to Podunk was Neptune’s Brewery in Livingston, Montana. Neptune’s usually offers sushi, a somewhat unusual concept for a microbrewery in the Inland Northwest, but we were out of luck. Even so, the chocolate porter earned this funky little spot an enthusiastic Podunk seal of approval.